- Food vendors - Three Peaks Outfitters of Cle Elum, WA will be serving delicious cast iron cooking for all to enjoy. Stop by the encampment for a unique and filling meal. Beverages are being run by Young Life of Ellensburg. More habitat has been added in the front and more detail in the elk as well as sthe trees. It's still not finished and as I have mentioned on this blog before, some days it feels like a work all day and don't accomplish a thing. This usually happens when painting grasses. It is nice to scroll down and see that actual progress is being made though. This is the study for a commissioned painting for the St. Clair Flats Waterfowlers Inc. conservation group. 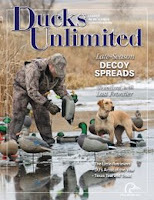 They are dedicated to conserving the habitat in the St. Clair Flats area, which is a renowned waterfowling hot spot in the country located on the Michigan/Canadian border. The painting depicts a cattail marsh (very common in the St. Clair Flats area) with a group of American wigeon coming in as seen from the hunter's perspective. 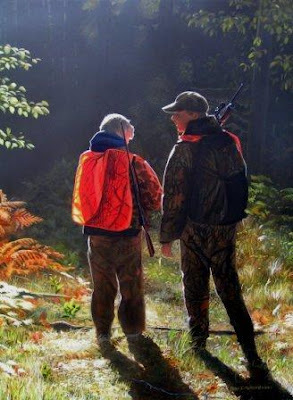 Hunters and groups like the SCFWI are instrumental in wildlife conservation and there are hundreds of local conservation groups around the country that gross millions of dollars for habitat conservation each year. 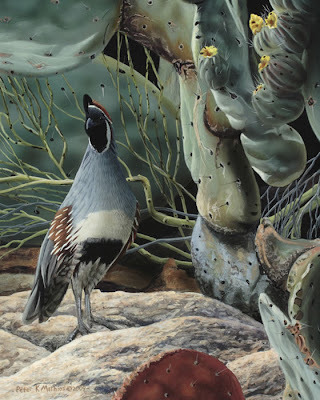 In this painting update more detail has been added to the background trees and the grasses. The elk haven't been touched since they were initially painted in except for blocking out some of the branches in the closest one's body. This is where the process of painting takes some time. I am now working on easing the dramatic pointed shape of the foreground shadow. Several times each year, I get commissioned to create a painting. 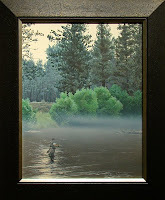 Sometimes it is of a family pet, or a special scene of someone's children, but most of the time it's a painting of a favorite hunting spot with ducks coming in. Inspired by an earlier painting I did called The Next Five, this painting is exactly that and is a surprise gift for a surprise 40th birthday party. 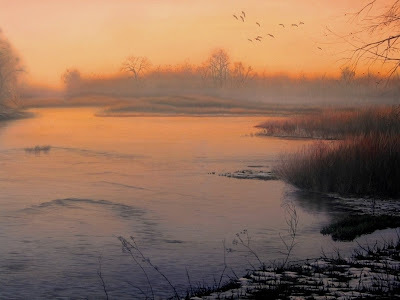 The painting features a flock of pintail coming into an Oklahoma wetland at daybreak. 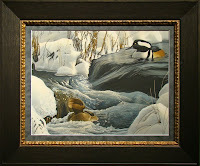 The focus of the painting was capturing the essence of the Oklahoma landscape. Early morning clouds offset the open skies where a flock of pintail have locked up their wings to sail in. The last of the Fall foliage clings to the trees as the marsh gets ready to surrender to winter. 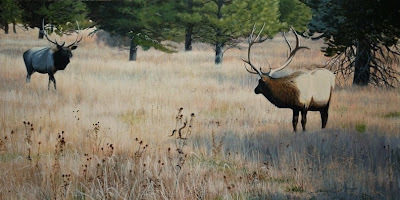 The second elk has been added as has some detail in the background grasses. There is going to be a lot of foreground detail and this painting is going to be a lot of work to get what I am foreseeing. I like the way the tension is developing between the two bull elk though. I may submit this image to the Rocky Mountain Elk Foundation for consideration to create a print to benefit wildlife conservation. They see many paintings from many artists, but it is always worth trying. This painting has just been started and my goal is to post continued progress as it happens, giving you a glimpse into the process. The first steps were to lay in the basic placement of the meadow and the future shadows that will be in the grasses. I then blocked in the background trees. All of this has been done with a #10 round and a #12 flat. The first bull elk was laid in with a #2 round. There is going to be another bull coming in from the uppr left hand corner, which is what the front bull will be looking at.